Two-way radios for retail and other organizations will ensure safety in the workplace. That seems like a bold statement to make, but workplace safety relies on solid communication among workers and supervisors in a timely manner. There is no faster means of communicating to a large group of employees than with two-way radios. Individual phone calls take too much time, and a public address system is just that – public. For discreet, immediate messages sent to all staff members simultaneously, walkie-talkies are the smartest choice. Here’s how two-way radios make employees safer, with specific real-life examples. In a retail environment, many different customers come and go. Larger facilities likely have a security team, but even they can’t be everywhere in the store. In the event of a shoplifter, unruly customer or medical emergency, retail staff with two-way radios can radio for assistance at the touch of a button. Most importantly, they can contact their fellow employees discreetly without alarming other customers. This goes a long way to ensure the safety of both employees and customers. Special events such as large outdoor concerts, festivals and school commencements can have many attendees, making security and attending to the needs of attendees quite challenging. Two-way radios let you broadcast to your entire team immediately, whether it’s to get medical help for someone who has fallen or to alert security personnel about a potential problem such as a disorderly crowd. In addition to handheld two-way radios and walkie-talkies, Tech Wholesale sells call boxes that connect immediately to staff members with radios. These can be effectively placed in college dorm buildings, warehouse loading docks, hospital and hotel hallways and many other locations in public buildings. In the case of warehouses, they can be used to let supervisors know about a new delivery. However, many of their uses involve public safety, as in the case of an intruder at a dorm or a medical emergency in a hospital hallway. Calling police on a cell phone will likely not provide as fast of a response as letting all staff members in the area know that help is needed. Especially in companies such as factories where potentially dangerous equipment and chemicals are used every day, two-way radios ensure that employees are safe at all times. Not only can supervisors notify other departments of a problem or danger. They can also put out a call for help in the case of an emergency. Broadcasting a need to many co-workers at once rather than chasing down the right person (or the closest person) enables a faster response time. Security personnel, upon encountering a problem at their facility, can quickly and quietly call for backup. Whether it’s a security team, hospital staff, retail business or another type of organization, two-way radios offer wide coverage in any environment, even where cell phone coverage may be spotty or non-existent. 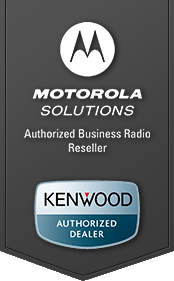 Also, if you need even wider radio coverage than your current handheld devices can provide, certain radio models (such as the Motorola RDX and the Motorola CLP Series radios) can be used with a two-way radio repeater. A radio repeater takes the signals from handheld units and amplifies them, rebroadcasting at a greater wattage and a higher physical location for improved coverage.